Monroe Area’s Chandler Byron showed why he is a Player of the Year candidate this year. The Hurricane’s dual threat quarterback rushed for 130 yards on 13 carries, scored four rushing touchdowns and threw a 59 yard scoring strike on his first snap of the third quarter in a 39-0 whitewashing of Morgan County last Friday night in Monroe. The win kept the third ranked Purple Hurricanes undefeated at 5-0 on the season and 1-0 in region play while the Bulldogs dropped to 1-4 overall and 0-1 in Region 8AAA. Things went awry early for the Dogs and they never recovered in this one. On Morgan’s first possession Monroe came up with an interception and returned it to the Bulldog 15. Three plays later Byron kept the ball and scooted six yards up the middle for Monroe Area’s first touchdown. The PAT made it 7-0 with 7:24 left in the opening period. Morgan County’s second possession was a replay as Monroe came up with another interception, ran it back to the 11 yard line and scored three plays later when Byron faked a quick pitch and shot through the middle for his second touchdown in the space of two minutes. Just like that it was 14-0 and there were still over five minutes left in the first quarter. The Bulldogs went three and out on their next offensive series and the punt only reached Morgan’s 43 yard line. A dive play from the Hurricane offense netted 29 quick yards to the 14 yard line. Five plays later Byron sneaked over from the one to make it 21-0 with 22 seconds left in the period and Morgan’s fate was pretty much sealed. Another Bulldog turnover on a fumbled pitch put Monroe in prime scoring position at the 20 but a high snap over the quarterback’s head led to a 19 yard loss. The Hurricanes still managed a 40 yard field goal and made it 24-0 with just over 11 minutes to play in the half. For the next 10 minutes Morgan County’s defense held Byron and the Monroe Area offense in check when they stopped them on downs and on a fumble recovery by Cole Freeman. But with just 30 seconds left in the half Byron shook free, bolted down the home sideline and scored from 67 yards out for his fourth rushing touchdown of the half. Monroe went for two on a direct snap and made it 32-0 at intermission. The night’s final score came on Monroe Area’s first play of the third quarter. Byron looked deep down the right sideline and unleashed a perfect throw to a streaking receiver who wrestled the ball away from a Morgan defender and scored on a 59 yard strike for a 39-0 advantage. On a night when there weren’t many bright spots the Bulldogs got good performances from Cole Freeman, Denver Laughlin and David Caswell. Freeman accounted for six tackles, seven assists, two tackles for loss and a fumble recovery. Laughlin finished the night with two tackles, six assists, two tackles for loss, a forced fumble and a fumble recovery. Caswell came through with a tackle, five assists and two tackles for loss. Additionally Jordan Huff finished the game with a pair of tackles, five assists and three tackles for loss. David Williams also played well for the Bulldogs with four tackles and four assists. Monroe finished the night with 236 yards rushing and 70 passing while Morgan County could muster only 138 yards of total offense. 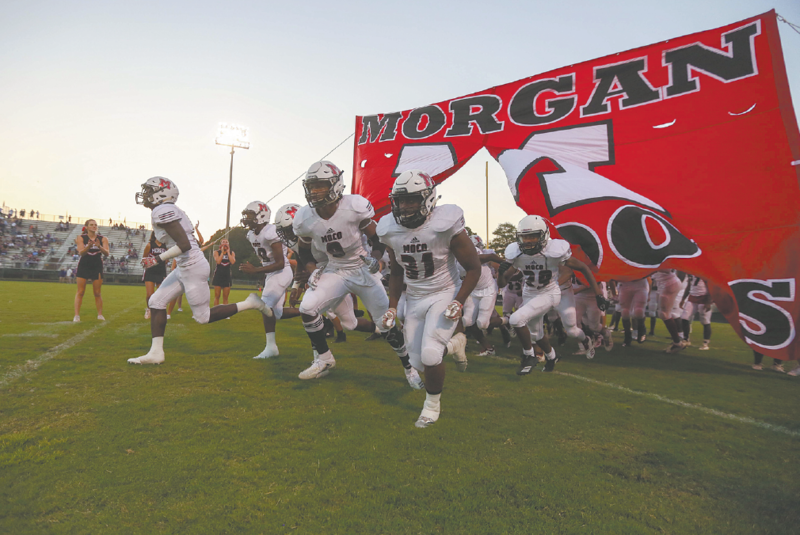 Morgan County’s Homecoming Game is on tap next as the Bulldogs host Jackson County in the season’s second region contest this Friday night at Bill Corry Stadium. Game time is 7:30. Jefferson 4-1 1-0 at Franklin Co.
Jackson Co. 2-3 0-1 at Morgan Co.
Morgan Co. 1-4 0-1 Jackson Co.